Passengers who present four (4) used Cotai Water Jet ferry tickets referring to different sailings in the same month are entitled to a free upgrade from Cotai Class to First Class in their next sailing (hereinafter, the “Campaign”). Passengers who present four (4) used Cotai Water Jet ferry tickets referring to different sailings in the same month are entitled to a free upgrade from Cotai Class to First Class in their next sailing in Cotai Water Jet City Route. 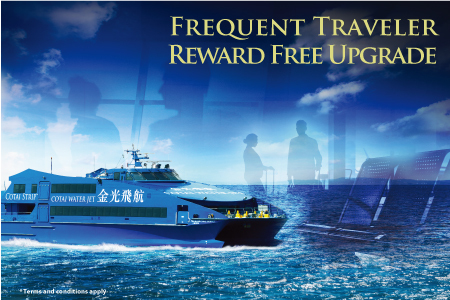 Every four used Cotai Water Jet ferry tickets can enjoy a maximum of one free upgrade. The used tickets should be paper tickets provided by Cotai Water Jet. Printed e-tickets are not accepted. Used tickets must be used one hour before the sailing, e.g. for sailing scheduled to 11:00 the presented tickets must be used before 10:00. The time of ticket use is based on the Cotai Water Jet System. Used tickets presented by passengers will be collected by staff upon use. This Campaign is only applicable to upgrades from Cotai Class to First Class in Cotai Water Jet City Route. There will be no upgrades to VIP cabin. The Campaign is only applicable to designated sailing date and time. The Campaign is subject to seat availability, with limited quantity, and on a first come first serve basis. All sailings must be finished on or before 30 June 2019. Cotai Water Jet will not be responsible for any lost or stolen ticket, and no reissuance of ferry ticket will be entertained. All ferry tickets which are altered or damaged will be void. This Campaign cannot be used in conjunction with other offers and discounts. Cotai Water Jet reserves the right to modify these terms and conditions or stop this Campaign without notice. This Campaign is subject to the Terms & Conditions of Carriage of Passengers and Luggage. If there is any dispute arising out of or in connection with the Campaign and/or these Terms and Conditions the Company reserves the right of final decision. The English version of these Terms and Conditions shall prevail in case of discrepancy between the English and Chinese versions.